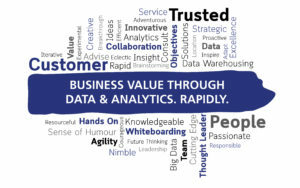 Business Value Through Data and Analytics. Rapidly. Project X Ltd. is a data and analytics, systems integration and support firm. By focusing on our clients’ objectives and best interests, our team of experienced and friendly professionals work collaboratively with you to drive value and insight to your business. Our integrated delivery model and Rapid Results methodology ensures our clients see wins along the course of a project and achieve results in a quick and cost effective manner. At our core, we are Nimble and Innovative solution providers that work collaboratively with you to streamline your business and provide rapid value from your IT investment. We are Passionate about all our projects and always look forward to the next big challenge. In 2005, founding partners Stephen Hayward and Graham Boundy combined their accumulative 30+ years of business, technical and consulting experience to form Project X Ltd. Throughout their history they have cultivated strong relationships with their clients, and continue to grow the business as required to meet client needs. In 2011, though the acquisition of the assets of BigDataLabs, Project X Ltd formed a wholly owned subsidiary Project X Labs Ltd. (www.pxlabs.ca) focused on product development around MicroStrategy.